Health leaders are appealing to people in Nottingham to make the right choices when choosing a care home. 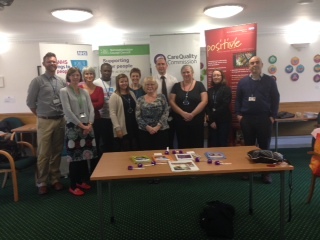 Officials from NHS Nottingham North and East Clinical Commissioning Group made the call to coincide with an event they have held to help the public make the right decisions about care homes. The event, held at the Gedling Civic Centre in Arnold brought together Nottinghamshire County Council, Nottingham City Council, AGE UK, the Care Quality Commission and voluntary organisations to offer advice and information to people about what to look out for when choosing a care home, what good care should look like and how to feed back about experiences – good or bad. A checklist of the things you should look for when choosing a care home is available to download from the AGE UK web site. www.ageuk.org.uk Here’s a summary of the sorts of things that prospective residents should look for when choosing a home. • Where is the home? • Are transport links good? • Are there any unpleasant smells? • Do the rooms feel hot and stuffy or cold and draughty? • Is there a relaxed and friendly atmosphere? • Will you feel comfortable chatting and socialising in the home’s public areas? • Do the rooms have en suite facilities or basins? • Will you be able to bring your own possessions such as pictures, plants and furniture? • Does the home allow pets? • Where can you spend time with your visitors? • Are there facilities for visitors to stay overnight? • Are young children welcome? • Is the home right for your cultural and religious needs? • Are there members of staff who speak your language? • Do the other residents seem to have a similar level of need to you? • What will happen if your needs change or increase? • Do you have your own GP and access to other health services such as opticians and dentists? • How many staff are employed per resident? For information about how to report good or bad experiences of a care call the Care Quality Commission on 03000 61 61 61, enquiries@cqc.org.uk. Or www.cqc.org.uk.